Jason Anderson: "Had a good weekend. Stoked on my first moto win! I just want to keep the momentum going and stay on the box." Jeremy Martin on the Podium Again at Mt. Morris! Kevin Strijbos on the Box in Italy MXGP! Anderson Back on the Podium at Highpoint! Clement Desalle Victorious at St. Jean D'Angely GP! Brian Hsu Collects his First EMX-125 WIn in France! Jeremy Martin and Cooper Webb Top 2 in San Bernardino! Clement Desalle 2nd place at Matterley Basin! Kevin Strijbos 3rd in Spain! Clement Desalle Wins at Talavera De La Reina GP! Glenn Coldenhoff 3rd at Italian GP! Clement Desalle Tops the Field in Italy! Desalle Finishes 2nd at Beto Carrero GP! Rockstar Energy Suzuki Double Pole Position in Brazil! Ryan Surratt: "Had a great week at Mini O's including a championship in 450 B Limited. Thanks for your support Rockstar!" Jeremy Seewer Wins Youth Award at MXoN! Dylan Ferrandis Picks up his 2nd Podium of 2013 at the GP of Benelux! Kevin Strijbos Finishes the Season Strong in Lierop with a 2nd Place Finish! Jeremy Seewer Finishes 2nd Overall in the EMX250 Championship! Jeremy Martin 2nd Overall In NY! Jeremy Seewer picks up his 3rd EMX250 podium in as many races! Clement Desalle Podiums at the GP of Sweden! Anthony Rodriguez collects 3 more podiums at Oak Hill! Cooper Webb wins 3 titles at Oak Hill! 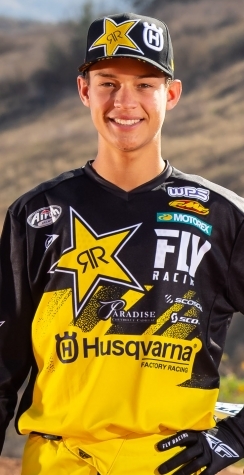 In his first race of the 2013 amateur season A-Rod won 2 titles and collected another 2nd place aboard his Star Yamaha!